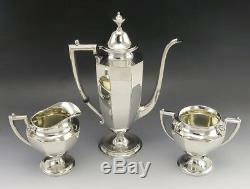 This set includes: 1 Teapot: 6 5/8 inches from handle to spout and 9 1/2 inches tall. 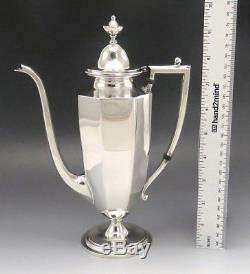 1 Creamer: 4 1/4 inches from handle to spout and 4 1/4 inches tall. 1 Sugar Bowl: 5 inches from handle to handle and 3 7/8 inches tall. 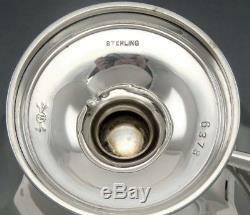 The underside of each piece is marked for Frank M.
Whiting and sterling silver purity. This set is in excellent overall condition. There is a tiny ding to the front underside of the creamer, but this is only really noticeable upon inspection. There is a very slight rock to the teapot. Powered by SixBit's eCommerce Solution. 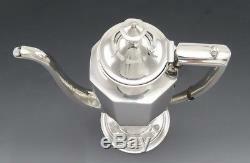 The item "Vintage 3pc Sterling Silver Frank M Whiting Art Deco Panel Style Tea Coffee Set" is in sale since Monday, November 19, 2018.